Union Township—Are you related to someone who worked at Hopewell Furnace? Did your ancestor do business with Hopewell Furnace Company or work in the Civilian Conservation Corps at French Creek? Friends of Hopewell Furnace President Jim McClelland will demonstrate how the public can now easily access Hopewell’s history from their own computer, tablet or smart phone. The free program will begin at 2 p.m. in the Hopewell Furnace Conference Center on Sunday, April 9. 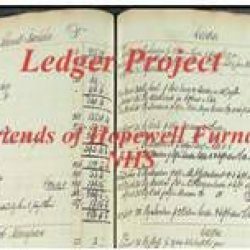 Called the Ledger Project, the Friends of Hopewell Furnace in cooperation with the National Park Service have placed on their web site a program that includes lists of the workers identified in the Hopewell Furnace Account books. These books include the transactions of the Hopewell Furnace Company, noting who was paid and often for what work. The program also includes the members of the Civilian Conservation Corps camps that worked to develop French Creek State Park and Hopewell Furnace National Historic Site. Friends President Jim McClelland is a retired systems and software engineer of 25 years of experience in defense satellites with Lockheed Martin. A communication electronics officer in the Air Force for four years during the last phase of the Vietnam War, he has served as an Adjunct Instructor at Montgomery County Community College, ITT Institute and is currently teaching at Berks Technical Institute. As a National Park Service volunteer and history buff, he has donated thousands of hours to providing access to Hopewell’s history. He holds BS of Aerospace Engineering from the University of Virginia and a Masters of Systems Management from the University of Southern California. Established in 1994, the Friends of Hopewell Furnace is the official non-profit fundraising arm of Hopewell Furnace National Historic Site. A 501(c)3 citizen organization, its mission is to support the preservation, maintenance and programs of Hopewell Furnace National Historic Site. Donations to the Friends may be tax deductible according to the rules set by the Internal Revenue Service. For more information visit the Friends web site at www.friendsofhopewellfurn.org. While at Hopewell Furnace National Historic Site visitors are encouraged to go into the village, tour the buildings and learn about iron making and why Hopewell Furnace is important to our nation’s history. Open 9 a.m. to 5 p.m. Wednesday thru Sunday, the park is located five miles south of Birdsboro, PA, off of Route 345. For more information stop by the park’s visitor center, call 610-582-8773, visit the park’s web site at www.nps.gov/hofu, or contact the park by e-mail at [email protected].